Here is one of the first miniatures I have painted in the new cave! It’s not for any specific project; I just found it amongst the lead pile and thought it would be fun. I believe it is from the AE Bounty line. I’m sure I’ll find a use for him. Last weekend I was in the video store, thinking how good space battles must look on my new television, when it occurred to me that I have never seen the last Star Trek: The Next Generation movie, Star Trek: Nemesis. It’s strange. Though I was never a Trekker (or a Trekkie for that matter), The Next Generation was one of the few decent science-fiction shows that aired during my youth, and I was a fan. 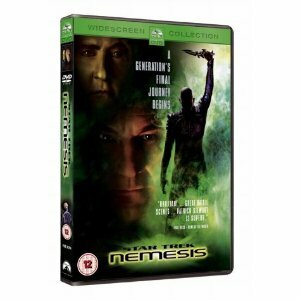 I’m sure I saw the other three Next Generation movies in the theatre, but never Nemesis. Well, this would never do. How could I live with such a hole in my sci-fi geek knowledge? I picked up the movie for £5 and brought it home to await the next quiet evening. Last night was that evening. So here’s the premise. A few decades ago, the Romulans created a clone of Captain Picard in the hopes of fashioning the perfect spy. However, the next Romulan government discarded the plan and the clone, and sent Piccard MkII (now named Shinzon) to the horrible mines on the planet Remus. Shinzon spent the next decade planning his revenge and, by means never fully explained, manages to escape his prison, create the galaxy’s most fearsome warship, lead a military coup and become the leader of the Romulan Empire. Sigh. Seriously, how did anyone agree to a script that had a clone of Piccard as the bad guy? It’s worse than that though. Shinzon is not fully grown, so our fearsome baddy is actually a petulant teenager bent on destroying earth because...well, I’m sure there was a reason in there somewhere. So, throw in another android that looks exactly like Data (because Lore wasn’t enough), a bunch of space orcs, a new type of super-deadly, previously theoretical radiation, and 60 minutes of really dull dialog and you’ve got the first half of the movie. The second half is just as bad, if slightly more action packed. My favourite low was when the baddies send a boarding party over to capture Piccard, a boarding party consisting of six guys, six guys to capture the captain of a ship containing hundreds, if not thousands, of trained personnel. Smart. Unsurprisingly, it doesn’t work, but it does allow Commander Riker to personally kill the orc that used mental powers to assault his wife. If I’m being negative, it certainly isn’t without reason, but there are a few good moments. Probably the best is when a hole is blown in the wall of the Enterprise’s bridge, exposing it space. There is also a really cool scene where Data jumps across the void of space from the Enterprise to the enemy ship. Unfortunately, both of those just serve to set up the whimper of an ending, when Data heroically sacrifices himself to save everyone (which feels like a last, desperate, attempt to bring gravitas to an otherwise pointless film). It is quite sad to see the Next Generation crew go out on such a story. While the series certainly had its flaws, its run was filled with interesting, complex philosophical questions in the best traditions of science-fiction. And even though I often found their conclusions a bit liberal and utopian, I give them credit for their exploration. It’s now been two weeks since the big move to the new cave, though it seems a whole lot longer. It still doesn’t quite feel like home, but it is getting there. There are still a couple of pieces missing: curtains for the lounge, a second desk in the study, a miniatures cabinet...but these will all come in time. Of greater annoyance is the large number of items currently not working at full capacity. That said, the weeks have not been without their good news and victories as well. The leak in the ceiling turned out to be nothing major. We now have curtain poles and blinds. After several gruelling hours in the arena, I managed to get the refrigerator doors reversed. I’ve nearly got my gaming cupboard set up the way I want it. All the lights have lampshades. It’s a work in progress, and we still have a long way to go, but it seems to get a little more like home every day. * I’m currently bringing you this blog thanks to a pay-as-you-go wireless internet connection. It’s slow, and I have to worry about how many MB of data I’m using, but it is better than the nothing I have otherwise. Packing up Under the Bridge! Please pardon the mess. Hopefully, in the next few hours, I will own my own home. We've got one van-load of stuff packed up and ready to move. The entire upstairs is empty, the downstairs is littered with boxes and furniture bits. Now we are sitting around, waiting for 'the call' to say we can collect the keys. This is probably the last time I'll have the internet at home for a couple of weeks, so the Troll might be a little quiet over the coming weeks. A few years ago, I remember hearing the announcement that the last story of Middle-Earth had finally been released. One can argue the truth of the statement, but there is no doubt, that at least here in Oxford, the release of The Children of Hurin by J.R.R. Tolkien was a big deal. I really don’t know why I didn’t buy it when it was first released, but I didn’t, and it soon faded from my memory. Recently, I found a very nice used copy in a charity shop for £3, snapped it up, and read it over the weekend. If you skip the rather extensive notes by Christopher Tolkien, then it’s a pretty quick read. Well, the short answer is yes, it is very, very good. But, when dealing with works of this magnitude, the short answer is rarely enough. I have little doubt that there are many people, even Tolkien fans, who don’t like the story, perhaps even finding it unpalatable. It is a dark, doom-laden tale, the equal of any Greek tragedy. The hero of the piece, Turin, is a great warrior, but a man constantly undermined by a dark fate brought about by his own pride and stubbornness. If it were a longer tale, I think the constant dark cloud of death that follows Turin would have worn down even this willing reader, but two things drove me forward. The first, and most important, is Tolkien’s language. Anyone who has read The Lord of the Rings knows that Tolkien was a master wordsmith and this work displays his skill like never before. His command of the English language and the many languages of his own creation are what truly sets him apart, even from the other great writers of fantasy. Once again, he uses his words to bring Middle-Earth to life with this tale of men, elves, and one really evil dragon. Yup, by the time the tale is winding down, it has become a classic dragon-slayer story, and neither the evil of the worm, nor the cunning and courage of our hero disappoint. Did I mention the book also includes a bunch of colour plates and pencil sketches by Alan Lee? 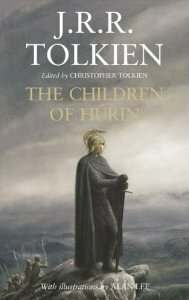 In the final analysis, The Children of Hurin is a must-have addition to the shelf of any serious fantasy fan, even if it isn’t likely to leave you feeling upbeat and positive. For the most part, I don’t enjoy reading comedy. I especially don’t like it in my science-fiction and fantasy. 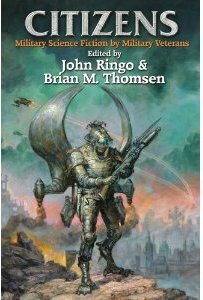 Thus, I was a bit disappointed when I read the first few sentences of Allamagoosa by Erik Frank Russell, the second story in the Citizens anthology. Mr. Russell makes it clear from the beginning that his story is a light-hearted poke at the military and not to be taken too seriously. As it turns out, I quite enjoyed the tale. It felt a bit like an episode of Black Adder set in space. Still, I found it a bit inane. After finishing the story, I read the notes on Erik Frank Russell in the back of the book and was astounded to discover that the story won a Hugo. Seriously? M On a recent trip to Forbidden Planet, I stocked up on Sci-fi Action paperbacks. 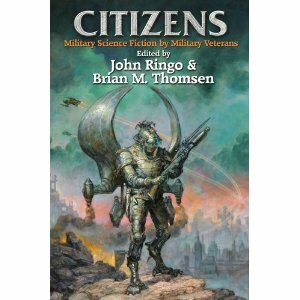 The first I cracked open is Citizens, a collection of military science-fiction short stories edited by John Ringo and Brian M. Thomsen. It caught my eye with its impressive, if strange, cover. The more I look at the cover, the more it just doesn’t look right. Certainly the guy’s bayonet isn't right – it only projects about an inch past the barrel of his gun! If the majority of the stories in the collection are of this quality, I’ll be pleased. There are a lot of really big names in the table of contents, so I’m hopeful. It must have been 1984 or 1985. I was attending a local comic book convention with my best buddy Peter Kranz. I don’t remember anything about the convention itself, but I do remember getting a special G.I. Joe preview comic, which included information on the new Joes joining the team. Why do I remember this? 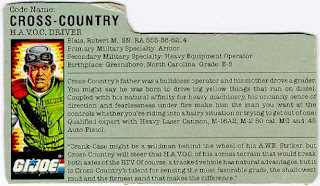 Because amongst the new Joes was one named Cross-Country who came from my hometown, Greensboro, North Carolina. I’m not going to lie, as a ten year old, this was a big deal, and I was filled with pride. If he could be a member of the G.I. Joe team, maybe I could as well? It was certainly a brilliant marketing move by somebody. Every G.I. 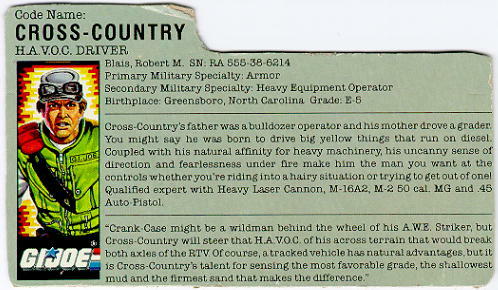 Joe had his hometown listed on the back of his card, and I’ll bet, like me, most kids had to have the hometown figure! (My parents were probably much chagrined to learn that my hometown hero was only available with the purchase of a big vehicle set). From that day on, I kept tabs on Cross-Country, following his career as best I could. He first appeared in the cartoon is season three, during the Arise, Serpentor! saga, and is first seen installing a tape deck in his vehicle. “Don’t worry sir, it’s fightin’ music. Every time I play it, somebody wants to punch me out!”. During this set of episodes, he would also shout one of the more amusing non sequiturs during a charge at the evil Cobra forces, ”JEB Stuart you are avenged”. In the long history of GI Joe figures, there have only been two made of Cross-Country. I have them both. They may someday make another, although I doubt it. While my troll ancestors were fond of grabbing passing billy goats and eating them raw, the modern Renaissance Troll should posses at least some skill in cooking and food preparation. Last night, I decided to test out my baking skills, while at the same time disposing of the now superfluous jack-o’-lantern. I believe, whenever possible, we should take the Native American approach to our food and use every part that we can. (Actually, that’s one of those things that Americans are taught as children, I really have no idea how true it is). So, when I first cut open my pumpkin, I separated out all of the seeds. These I roasted. Roasted pumpkin seeds taste a bit like popcorn, and certainly fulfill a similar spot on the snack food chart. Usually, I add a healthy (read: unhealthy) dose of salt, but this year I went with a bit of Creole seasoning to give them a bit of extra kick. I threw out the gooey pumpkin pulp. If someone knows to what useful purpose this can be put please let me know. Anyway, last night, I cut the dead jack into eight pieces and put them in the oven to slow roast for an hour. I even included the pumpkin stem. Why the stem? Well, as a guy pointed out over on the Lead Adventure forums, these little suckers look exactly like miniature tree stumps. I wanted to dry it out to use in a future modelling project. After an hour, I took the pumpkin bits out of the oven, scooped the pumpkin meat out of the skin, threw it into a blender, and reduced it to a fine soup. Then, following Mama’s recipe, I added flour, a couple of eggs, butter, sugar, cinnamon, poured them all into a bread tin, and put it all back in the oven. Fifty minutes later, I had a really tasty pumpkin bread. Well, one could argue the dividing line between ‘cake’ and ‘bread’, but it was bread shaped, so that’s what I’m going to call it. Okay, I didn’t use the pulp, and I’m not sure to what good use I could put the pumpkin skin, but all in all, I’m pretty happy with my efforts to make my pumpkin count! Unfortunately, in the darkness nearby, the evil Vegimancer was gathering his pumpkinheaded forces. Leading his main attack group, the forces of the Vegimancer drove in the Confederate pickets and reached the baracade before the rebels could fully moblize.﻿ Still, the Confederates managed to form a makeshift firing line to meet the threat. Meanwhile a smaller force of pumpkinheads attacked from the rear, lead by Col. Seed. Confederates fight back against the rear attack. The Union prisoners flee, along with one of their guards, while the other is left to fight a pair of vicious little gourd heads. A shot of the whole table just after the initial Confedrate line is overrun. Rotpatch, the pumpkin patch golem, wades into the rebels weilding his rusty scythe. Confederate infantrymen desperately fight against Rotpatch, buying time for the artillery crew to load the cannon. Seconds later, the cannon would blast Rotpatch into a spray of orange pulp. Desperate hand-to-hand fighting around the cannon as the main body of pumpkinheads reaches the Confederate second line. Thankfully, Confederate fire had taken down enough pumpkinheads that they were able to overwhelm the remaining gourds. The humans were victorious, but the price was high. Only fourteen Confederates and two Union soldiers survived the night. The horrors of the battlefield. The Vegimancer disappears into the night, his forces defeated. A very fun little solo game that I was able to play between handing out candy on Halloween. I used a modified version of the Battlefield Evolution system, which works very well for these last-stand style games. 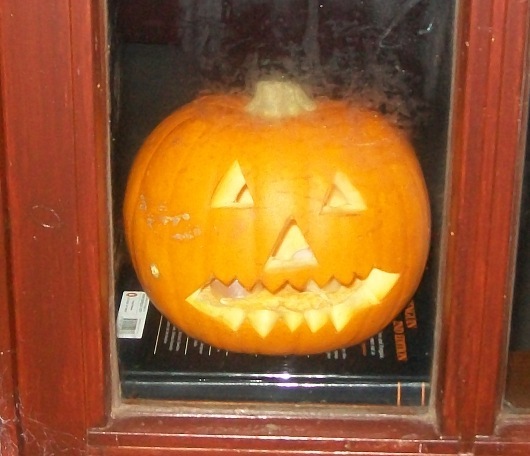 For the last five years, I have enthusiastically manned the door each Halloween night, prepared to face a horde of little ghouls and goblins. But each year, I have been slightly disappointed. Never have we received more than twenty trick-or-treaters. This year, I decided I needed more advertising to get the message out. 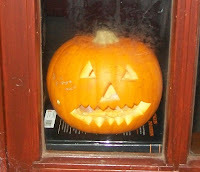 So I carved a jack-o’-lantern, stuck a candle in him, and plonked him in the window. Within 90 minutes, the house had been visited by 36 little spooks and spectres and emptied out my candy bowl! So I had to close-up shop early, which was a little disappointing. Still, it was nice to see the tradition being carried on, and to hear the loud voices of excited children as they roamed the night (every group under supervision, I might add).